Ever since they entered the market, UHURU products have been a favorite choice for many tech lovers. The brand’s line of computer accessories offers many different devices suitable for a variety of users. The combination of good quality and affordability that UHURU offers appeals to many. In this review, you’ll see a great example of this. UHURU’s wireless keyboard and mouse offer pretty much everything that a user needs to make their PC experience more enjoyable. Let’s take a closer look at what it is that makes this set so complete. This is one of UHURU’s latest updates of their wireless computer accessories. 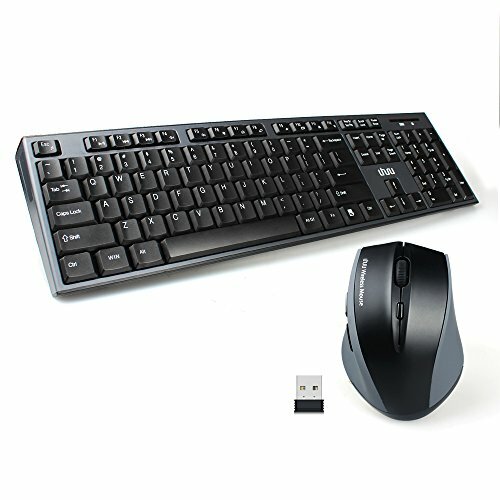 The keyboard and mouse set is designed specifically for Windows and works on a variety of devices, including smart TVs, laptops, and Microsoft Surface Pro. Both devices come with a set of handy features that will satisfy the needs of even more demanding users. The battery life is great, the build quality is surprisingly high, and both the keyboard and mouse are very comfortable to use. Also, the connection is stable and reliable. The way these devices are designed ensures that many different categories of users can benefit from them. When designing this keyboard and mouse, UHURU thought about more than just average users. No matter if you’re a professional, gamer, or just someone looking to refresh your PC equipment, these devices can be a great choice. Thanks to how comfortable they are to use, you can rest assured that with them, using your PC for long periods of time will be much more enjoyable. They also offer a variety of features that make them very capable and versatile. Of course, this doesn’t make them perfect. Users looking for high-end equipment might not find this keyboard and mouse suitable for them. So, unless you’re only looking for the best of the best, these devices are likely to satisfy your needs. If you order this keyboard and mouse, the package contents will be pretty standard, so there are no surprises here. Apart from the keyboard and mouse combo, you get a wireless Nano-receiver, one AA battery, one AAA battery, and a welcome guide. UHURU also offers a limited free replacement for up to 12 months, should anything go wrong with these products. The number of features these devices have makes them a great bang for the buck. First of all, the keyboard is well-made, so you won’t have to worry about its durability. The butterfly-structure keys offer smooth typing, and the placement of the keys minimizes typing errors. There are also foldable stands, which will let you adjust the keyboard’s angle to make typing even more comfortable. In total, there are 13 hotkeys, paired with shortcut keys that will ensure a smoother user experience. As for the mouse, its ergonomic design ensures that it fits comfortably in your hand, so your hands won’t tire easily even after hours of use. There are three DPI levels: 800, 1200, and 1600. This makes the mouse versatile and ensures it can adapt to both gaming and everyday needs. There’s one Nano-receiver that connects both devices to the PC and ensures a stable connection. Thanks to the energy-saving function, the batteries can last fairly long. Overall, there’s really not much to complain about. The only potential issue is related to longevity, as some users have experienced drops in performance after some time. Other than that, this keyboard and mouse combination does a more than decent job. Before you pair the keyboard and mouse with the PC, you need to make sure the latter uses Windows, the only OS supported. Setting them up is really a breeze. All you have to do is plug the Nano-receiver into the USB port, place the batteries into the devices, and turn them on. They’ll pair automatically, without the need for any additional software. Even though these devices offer great value for money, some users might still want to save a couple of bucks when buying a wireless keyboard and mouse. If this is the case with you, you should check out the more affordable Logitech MK360 wireless keyboard and mouse combo. With a very attractive design and a battery life of up to 3 years, the MK360 can be a great alternative. It also comes with plenty of useful features. It’s safe to say that UHURU’s solution is among the best out there in this price range. These devices can meet the needs of virtually every user, except for high-end gamers. UHURU presents new accessories on a regular basis, so we’ll probably see many more exciting devices from this manufacturer in the future. But until then, this keyboard and mouse will do the job just fine.